My earliest sparring sessions in karate were without the mandatory protective gear you see today. The only requirement was the groin protector; a mouthpiece was optional. By the 80s, foam head gear and hand guards had become compulsory for most schools per insurance purposes. Probably the biggest argument against the use of protective gear is that it conditions the student to a kind of safety net that isn't always available. And yet despite this added precaution, the potential to get seriously hurt during a match still exists. In truth, the protective gear users may be instilled with a false sense of security and in turn feel that they have carte blanche to commit mayhem on one another. One article refers to this as risk compensation, which basically means we adjust our danger levels in accordance to so-called security measures. The issue of protective fighting gear presents an interesting dichotomy. On one hand we have the time-honored body hardening techniques that are purported to forge our bodies into steel. I have my doubts, but you'd be hard pressed to find a Thai boxer who's heard of shin guards. Traditional karateka pound the makiwara (striking post) bare knuckled, yet Western boxers wrap their hands with gauze before lacing up a pair of 12 oz. gloves. On Okinawa, karate fighters occassionally wear bogu, which is the protective armor used in kendo (sword-art). Bogu includes a chest protector and a full-face shield. Again, the idea is that players can go full tilt in matches without killing one another, try as they may. Obviously, padded protection is an absolute must for children involved in any sportive striking-style martial art. Dojo Rat just wrote a piece on a Missouri school that teaches MMA to kids as young as six. Hopefully, safety will be stressed when showing these little tykes submission moves. The next time you train, try sparring without your fighting gear. It will feel strange and uncomfortable, and you'll probably feel reticent about loading up on shots. At the very least, it'll provide you with an interesting reality check. I've done this already with an instructor I really trusted. It's eye-opening and it makes you move much better. Getting hit with a padded foot versus an unpadded one makes a big difference. Imagine the reaction back in the days... karate to kids??? Time passes, things don't change that much. What? parents are scared of ending up in an armbar? I've used both styles of fighting. None and the full bogu. Both have advantages. But even with the full armor, you still get hurt. There is no going around it. You train for combat, play with fire. You *might* get burned. There always is someone punching hard enough for the other person to feel pain through the armor. To kick you 3 feet away. It hurts. Big time. I accidentally cut my senseï's breath for about 10 seconds with a punch to the sternum. It was very freaky. Remember Funakoshi? He was against sparring. That's even more interesting. And then, Mutobu was for fighting as was mas oyama who was reknowed for his prowess and his fear to lose. In 1920(around) Chitose Sensei wrote a book where karate's historic fights where being debated. That is almost a century ago. Then, there are all those duels that happened in the 1800's. You know, one has to ask the question... Are we getting any smarter? If we are, where do we go from here? I wouldn't have had a problem trying to spar without gear but I don't think anyone I ever sparred with had enough control to attempt it without serious bodily injury occuring. Getting hit with a padded foot versus an unpadded one makes a big difference. Foot guards do make a big difference, but also for the person wearing them. Striking with the ball of the foot (like in front and round kicks) becomes a moot point because of the confines of the padding. Ditto with shoes. If you try round kicking with the instep without protection, you'll end up breaking or injuring something, especially if you clip someone's elbow. Never tried the bogu. The first school that I did see that had them, I thought they taught fencing or something. I had no idea. There's the old-time traditional bogu that looks heavier than the streamlined modern stuff made of plastic. I'm sure there's a difference when you go to fight. There's no shortage of those types. Control is everything in the martial arts, not just in sparring but all facets. A longtime instructor recently wrote that there are some people who shouldn't be in karate because they lack self-control. Sparring without pads is very different. I've done it a few times. Once in a seminar given by Sensei Advincula many years ago. My partner and I rapidly discovered that the dojo-wide habit of tapping lead hands to judge distance hurt like heck when you were rapping wristbones instead of padding. More recently, I have sparred with my sensei unpadded for demonstrations. We both trust the other's accuracy and judgment and it makes an impressive show. Especially after the TKD people have finished their sparring, padded to the hilt. Thanks for the article-love! It's one of my favorites. No, thank you. It's a great article. When we start people off sparring, we use 16-oz boxing gloves and mouthguards to help them get comfortable. 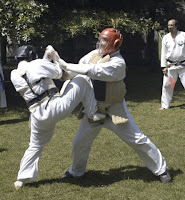 At this precarious time, they take more hits than at any other point of during their development as a martial artist. As they increase their skill level and control they get more comfortable with sparring. At this time, the students switch over to 4-oz MMA gloves, which are much closer to bare fists. I understand the importance of emphasizing that on the street your fists aren't protected, which is why we encourage students to use open hands in real street situations. But in class, without protection, students can get injured needlessly, causing them to miss classes. Thanks for stopping by, Lori. I put you on my blogroll as well.